Servicemen and women, we salute you — and so do plenty of companies that are showing their gratitude in the form of discounts and other offers. In addition to Veterans Day-specific discounts (stay tuned for our post on this year’s batch), lots of companies offer year-round special savings to active-duty, reserve and retired military members. For many of these discounts, you just have to ask. Most establishments will request to see valid military ID as proof of service, however, so keep yours handy. Whether you’re looking for a meal, snack or treat, these eateries will give you a break on your bill. The military discount at Ben & Jerry’s varies by location, but it’s usually around 15%. All active and retired military save 10% on Famous Dave’s authentic, pit-smoked BBQ and made-from-scratch sides. Ask your server for details. Participating DQ locations offer 10% off your order. Denny’s 10% discount is available to “first responders” — which includes active-duty military personnel. The military discount amount at Hooter’s varies by location, but it’s usually around 15% and is good for both active and retired service members. It might only be available on certain nights, though, so you might want to call ahead to check. Show your military ID at Golden Corral and get 10% off an endless buffet dinner at Golden Corral. Lone Star Steakhouse offers a 20% military discount on Mondays and 10% off the rest of the week. The military discount amount at Texas Roadhouse varies by location, but it can be as much as 20%. Show your military ID to your server at IHOP and get 10% off your entire meal. In the mood for some Asian food? Active-duty personnel can enjoy a 10% military discount at Panda Express. In addition to sending free coffee overseas for troops, Dunkin’ offers Veterans Advantage members 10% off on online orders. Present a valid ID and ask for a manager at The Home of the Whopper and get 10% off at participating locations. Flash your ID and get 15% off at Hard Rock Cafe. Whether you’re craving a family adventure or a date night, you can enjoy a discount on your entertainment. The Waves of Honor program grants free one-day admission for all military service members (active, Guard and Reserve) plus up to three family members. This offer is good at a variety of SeaWorld and Busch Gardens parks across the U.S.
Veterans Advantage members can receive up to 40% off movie tickets at AMC Theaters, and most theater locations offer military discounts on certain days and/or times of the week. Check with your local box office for details. Whether you’re active or retired, you can get a discounted military rate on any Carnival cruise line (Carnival, Princess and others) by submitting a copy of your discharge papers via fax, mail or email. This offer is also available for spouses of active-duty personnel — see the Terms & Conditions page for more details. Military personnel living in or visiting California have a choice between two Disney Park Hopper Tickets: a 3-day Park Hopper Ticket for $168 and a 4-day Park Hopper Ticket for $188. Both options offer entrance to both Disneyland Park and Disneyland California Adventure Park. Military personnel living in or visiting Florida also have a choice between two Disney Park Hopper Tickets: a 4-day ticket for $226 plus tax or a 5-day ticket for $246 plus tax. Park Hopper Tickets include admission to Magic Kingdom, Epcot, Disney’s Hollywood Studios, and Disney’s Animal Kingdom. Military personnel can also enjoy discounts at Disneyland Resort Hotels in California and at Disney Resort Hotels in Florida. Visitors to LEGOLAND California can save over 50% on admission and receive 2 days free with the LEGOLAND Resort Hopper Military Exclusive Ticket — that’s 3 days for less than the price of 1 and includes admission to LEGOLAND California, SEA LIFE Aquarium and LEGOLAND Water Park! Or check out the discount on the LEGOLAND California SEA LIFE Hopper Ticket, which is 30% off plus a second day free. Both offers are good through December 31, 2018. If you’re looking for just a 1-day admission ticket, your military ID will get you 25% off a LEGOLAND California ticket. Active duty military members can visit LEGOLAND Florida for 1 day for free with no blackout dates or restrictions. Deeply discounted tickets are also available for non-active duty/family members and veterans, some of which also include a second day for free. Visit your military base’s Information, Tickets and Travel (ITT) office for more details. And if you decide to go to LEGOLAND Florida on a whim, just flash your military ID for a 10% discount on 1- and 2-day tickets. As part of the Birdies for the Brave outreach and appreciation program, service members can receive complimentary or discounted tickets to select PGA tour events. In addition to special military appreciation days, many MLB teams also offer discounted tickets throughout the year. Check out the full list here. Enjoy America the beautiful! Military members and their dependents are entitled to a free annual pass that grants them access to all U.S. national parks. Both Universal Studios Hollywood and Universal Studios Orlando offer exclusive military discounts and packages through local base ticket offices. Planning a trip? Use your ID for deals on planes, trains and automobiles. Active-duty military personnel and their immediate family (spouses and dependents) can get 10% off the lowest available fare on most Amtrak trains. Select “military” for each applicable passenger when using the Amtrak Fare Finder search. In addition, uniformed service members can move to the head of any Amtrak ticket line. Active-duty and retired military personnel and their immediate family (spouses and dependents) can get 10% off Greyhound walk-up (unrestricted) fares, and 10% off tickets purchased online with the Veterans Advantage card. Active-duty servicemembers, veterans and their families can enjoy up to 15% off their stays at participating Hampton Inn hotels and resorts. Some restrictions apply, so be sure to read the Terms and Conditions for full details on how to claim your discount rate. American Airlines offers special perks for military members, from early boarding for active military members to sponsored Honor Flights, which offer veterans free trips to Washington D.C. to see the monuments that stand in their honor. U.S. Medal of Honor recipients also receive access to elite inflight amenities. Active-duty and retired military personnel are eligible for the government rate for both business and personal travel stays at La Quinta Inns & Suites. Select “Government” rate type or use promo/corporate code “GOV” when searching for rooms on their site. Active-duty and retired military personnel get 10% off personal stays for themselves and their spouses and families at Hilton Hotels & Resorts. See Terms & Conditions for specifics. Enjoy discounted rates, upgrades and complimentary membership in Hertz’s Gold Plus Rewards program when you rent a car with a military discount code number. Save up to 10% on select cruises for yourself and your family by looking for sailings with a blue and red star icon next to them. Active-duty service members qualify for discounted room rates at Marriott Hotels. Select “Government & Military” under the “Special Rates” section when booking your stay. Active-duty and retired military personnel and their families get discounted one- and two-person rate at Choice Hotels. You’re also eligible for the new Choice Privileges® Armed Services program, which enables you (and your spouse and dependents) to enroll in the Choice Privileges reward program at the “Elite Gold” level. From Holiday Inns to Candlewood Suites, Intercontinental Hotel Groups offers military personnel discounted rooms under the government rate. You may reserve your room with the military rate online, however, you must present your military ID at check-in. Yes, you can even save money on your bank accounts, loans and credit cards. The Servicemembers Civil Relief Act (SCRA) restricts interest rates for active-duty service members to no higher than 6%. This applies to everything from credit cards to mortgage and auto loans, and protects both service members and their families for the duration of active duty. For more information on all the benefits of the SCRA and eligibility, see here. In support of the Servicemembers Civil Relief Act (SCRA), American Express waives all fees for active-duty military personnel. This includes annual membership fees on all of their cards (including the $550 fee on AmEx Platinum) and may also include refunding late fees incurred while on active duty. To claim these benefits, you can submit your request online or call the 1-800 number on the back of your card and ask that your account be designated as “active-duty military” in compliance with the SCRA. If the customer service rep you initially speak with isn’t familiar with the act, just ask to speak to a supervisor. Opening a checking or savings account at Chase? You can get the Premiere package for free — it’s normally $25 and includes a debit card, free safety deposit box and other goodies. Just show your ID or discharge papers when you open your account. Chase also offers other perks for military service members, including special benefits for home lending and auto finance. Bank of America has specific banking solutions tailored to military customers, including checking, savings, credit cards, mortgages and loans. 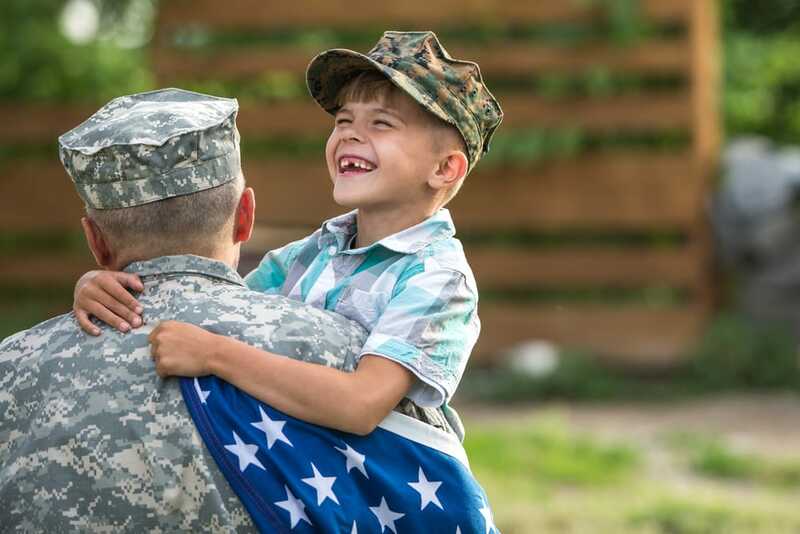 Capital One also honors SCRA benefits and offers an entire SCRA resource page to help military service members learn more about the benefits. To learn about Capital One’s military offerings, call up their dedicated customer service line at 1-855-CAP1MIL (227-1645). Citi Salutes has a number of programs and services for military servicemembers, from the HomeRun for Heroes mortgage program to the Disabled Veterans Mortgage Relief Program. Opening an account online with U.S. Bank? All active-duty servicemembers and veterans are eligible for their free Premiere checking and savings package and other perks, from VA home mortgages to career opportunities. Renovating or redecorating? We’ve got you covered. Show your military ID at Home Depot to receive a 10% discount. Total savings are capped at $500, and this discount may not be usable in combination with other deals. You may also be able to get a discount on online orders if you place them over the phone — call the Online Customer Care line at 1-800-430-3376 to speak to a representative. Active service members, veterans and their immediate family (spouses and dependents) get 10% off in-store purchases at Lowe’s. This offer cannot be combined with other promotions. Stock your kitchen with a 15% discount (10% for electronics) with proof of service or valid ID. This veteran-owned site selling “farmhouse country” style home decor offers servicemembers a 10% discount if you use the code “militaryservice” when you check out. Your purchase also helps support fellow veterans — $1 of every order over $25 goes towards organizations like the Wounded Warrior Project. Going shopping? Don’t forget your military ID, which is good for savings at these retailers. Show your military ID and get 15% off any purchase of jeans, T-shirts, shoes and more at American Eagle Outfitters. Get 10% to 15% off clothing from Banana Republic with your ID. Flash your military ID and get 10% to 15% off casual apparel and accessories at Aeropostale. Get 10% to 15% off most merchandise at Eddie Bauer (some promotions excluded) with your military ID. This activewear brand offers 10% off online and in-store purchases. All active, retired, and reserve military personnel can get a discount on the latest fashions for the whole family at Old Navy (may vary by location; in-store only and valid military ID must be presented at time of purchase). Get 10% off your in-store purchase of outerwear, luggage, accessories and more at Wilson’s Leather with a valid military ID. Show your military ID to get 10% off the latest trendy clothes, accessories and shoes at Forever 21. Get 10% off at Charlotte Russe with your military ID. Save 15% at this bridal boutique that carries wedding gowns, gowns and more. Flash your military ID and get 10% off your next apparel purchase at Maurice’s. This men’s clothing brand offers all military personnel and their family members 25% off online orders with proof of service. Known for men’s short-shorts, Chubbies offers an exclusive discount to military personnel. In order to receive the discount code, simply verify your military status here and you’ll receive a 10% off reward code. This sports apparel and fan gear shop offers all active-duty and retired veterans and their families 10% off plus free shipping on all orders of $40 or more. Get 20% off athletic footwear, apparel and sports equipment online and by phone at Eastbay if you have a Veterans Advantage Card. This retailer of athletic shoes and apparel for men, women and children offers a 20% discount with military ID. The sportswear and footwear retailer offers 20% off with military ID. Bring in your military ID for 10% off your next purchase at Payless. This retailer of stylish, rugged apparel offers a 15% discount with valid military ID. Shop kids shoes and clothing from big-name brands and get 20% off with your military ID at Kid’s Foot Locker. The Finish Line offers a 10% to 20% discount to all vets and active military personnel. Need a new laptop or printer? Consider these retailers. Dell offers a 10% discount for all military members and veterans. Be sure to also check out this page for additional specials and promotions. Check out Apple’s Military/Government Purchase Program to learn more about the various special offers and discounts currently available. Hewlett-Packard’s military discount is offered through the HP Member Deals Program. Sign up online here or call 1-800-473-4732 for more information. Active-duty servicemembers, reserve military personnel and veterans are eligible to receive special discounts on a number of military products. Check out Microsoft’s website for more details. Save a little cash on your cell phone plan. Sprint’s military discount varies. Register here to find out how much you can save. Sprint will also allow you to put a “hold” on your service when you’re deployed, which will save your phone number while not incurring any fees. Call 1-877-633-1102 for information on how you may be eligible to receive a 15% to 20% discount for Sprint Business. Check out military discounts on mobile and voice data services on AT&T Wireless’s website. Verizon offers numerous discounts to servicemembers and veterans, as well as federal employees, including $15 off the Go Unlimited and Beyond Unlimited monthly plans, plus 15% off other eligible plans. You may also be eligible for data discounts, as well as 25% off accessories in some cases. Apply online, where you will need a DD Form 214 or Veteran Card. Whether you’re buying a car, getting an oil change or doing a little DIY maintenance, use your military ID to save a few bucks. Car shopping? Show your military ID and get $500 off your vehicle from Toyota, plus an additional $500 off for first-time buyers. Be sure to check the fine print for restrictions. Ford’s Military Appreciation Program offers active duty and veterans within 24 months of separation cash back with the purchase or lease of a new Ford vehicle. You can sign up at any Ford dealership or register online. Chrysler offers all active, active reserve, retired military, retired military reserve and honorably discharged veterans within 12 months of discharge date $500 in military bonus cash under the military incentive program. Chevrolet offers a military discount program to all active duty military personnel, including veterans within one year of discharge date, as well as retirees and their spouses. Registration for the military discount program can be found here. Nissan’s military program offers active, reserve, retired and veterans within 12 months of active duty anywhere from $500 to $1,000 in savings on a new Nissan. Stop by your local Nissan dealer to learn more. Harley-Davidson’s Stateside Military Financing Program offers active-duty military personnel financing with no down payment, reduced rates and flexible terms. More information is available at your local Harley-Davidson dealer. Active-duty military members, veterans and their families can get 5% to 20% off auto accessories and performance parts from Auto Accessories Garage. Get 10% off regularly priced items at Advance Auto Parts (in-store only). O’Reilly Auto Parts offers 10% military discount to both active and retired military personnel and their immediate family members. The discount applies to most items, with a few exceptions, and is available in-store only with a valid military ID. Jiffy Lube offers 25% off most services with a valid military ID. Go play outside with these discounts on outdoor and sports-related gear. Gear up for your next outdoor adventure with a 10% discount from Bass Pro Shops Military Discount Days, which start on the 15th of the month and last for a week. Champs Sports offers 20% off most purchases online. You will need to submit proof of service in order to use the discount. The average military discount at SportsMemorabilia.com is 10%; however, this may vary depending on the item. In order to receive a discount, be sure to contact the sales team via phone or live chat. Save a little bit on education for yourself or your family members. Eligible students in U.S. military families can connect to a live tutor online at any time at tutor.com for studying, proofreading, homework, test prep and more. The service is available for free to K-12 students and some adults in active-duty families. You may be eligible for the Ashford Military Grant, which reduces tuition for all undergraduate courses to $250 per credit for all active duty and veteran servicemembers, along with military spouses and dependents. This grant also covers the sales tax, technology fees and course materials, including standard shipping costs where applicable, required for an eligible student’s program of study when purchased through the Ashford University bookstore or a textbook partner. Planning to pop the question? Shave a little bit off the cost when you buy from these retailers. Ready to pop the big question? Get 10% off an engagement ring and/or wedding band from Since910.com by providing a U.S. military email address. All active-duty, retired, disabled veterans and registered dependents of active-duty and retired military get a 10% discount when placing an order in-store, online, or over the phone at 1-800-HELZBERG (435-9237). Most store locations have the same discount, but be sure to call ahead to confirm. Proof of ID or online verification is required. Zales offers a 10% discount for active and retired military, but you’ll need to contact the company to confirm the discount. Register on Zoara.com with a valid military ID, use code “USMILDISC” at checkout, and receive a 5% discount on fine jewelry. All military servicemembers, first responders and their spouses and immediate families can use the code “MILITARY” at checkout to receive 15% off their entire purchase at. A photocopy of your military I.D. is required to receive the discount. Moissanite Bridal offers military members a 5% discount off the purchase of an engagement ring. Active-duty military members get a 5% discount off wedding rings and bands. Military members get a discount on engagement rings when they enter the code “USTROOPS” in the discount box when checking out. Looking for a few more ways to save? Here are a couple of discounts that didn’t fit our categories. Get a flat 15% off by showing your military ID. Discount varies from store to store, so be sure to ask a sales associate at your favorite location. JOANN Fabric and Crafts offers military servicemembers and eligible family members a 10% military discount. What’s even better is the discount not only applies to regularly priced items, but also to sale and clearance items. This high-end brand offers special deals to military and government members with the Oakley Standard Issue membership. You must verify your military or first responder status in order to sign up. Deployments can be tough on kids. Sweet Dreams Pillows offers a free pillow to each military child featuring a picture of their overseas mom or dad. Parent must be on active duty and deployment must be at least three months. Active military personnel can take $20 off their relocation or storage costs by mentioning the promo code MILOFF20 to a customer service representative.